I am definately learning NOT to act on every "good" idea that comes into my head. Take this "Fun Fur". Fun? ...not so much. It is the hardest yarn that I have ever worked with. I know why it has been referred to as "eyelash" yarn now. The tiny eyelash size little fibers that make it soft also make it impossible to work with. The little suckers get stuck and tangled as you try to knit or crochet. I got soooooo frustrated while knitting the darn thing that I almost threw it out the window. Instead I stopped , pulled it out and tried it in crochet. It really was easier especially with a large hook. Two more to go! A good friend called me today to say she would like to buy 4 scarves. So, Judy I thought about it I came up with a fair price that includes material and the labor intenstity factor. How about $1,000 each. Spell my name correctly on the check Please! I think despite all the headache (I hate these yarns too) it turned out quite pretty. 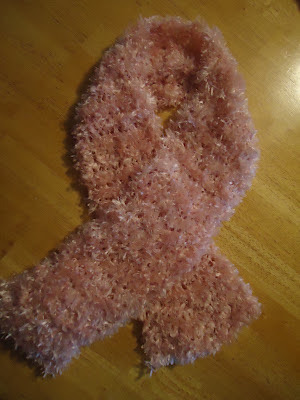 Perhaps it's something you can use to celebrate at one of the many breast cancer awareness events this fall? It'd be the perfect color to show your support! 1000.00 bucks! Sounds fair. I'll take 100! Hi Lynn, people ask me what I will blog about when I catch up with my unfinished projects...What? I will never catchup...I can always break out the unfinished photo albums and books/articles to read and recipes...etc....Have a great day.